Once a child complained to his father about his life and asked why life was so hard for him. He did not know how to deal with it and had almost given up. He was tired to fight as every time one problem was over, a new one cropped up. His father, a chef, took him to the kitchen. He filled 3 pots with water and set those on fire. 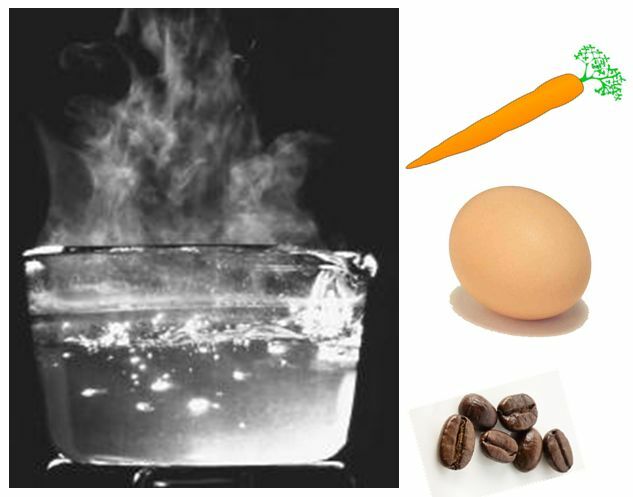 After the water in the pots came to boil, he put the carrots in the first pan, the egg in the second and coffee beans in the last pan. He let those boil in the water without saying a word. The child was silent too and waited impatiently, wondering what his father was doing. After 20 minutes, the father put out the fire. He then took out the carrots in a bowl, lifted the egg and put it in another bowl, and poured the coffee in a cup. He then asked the child, "What do you see, son?" "Carrots, eggs, and coffee," replied the boy. Her father took him closer and asked him to feel the carrots. He did so and noted that carrots were soft. His father then asked him to break the egg. it. After removing the skin, the son found that the egg had hardened. Finally, the father asked his son to sip coffee. The son took a sip and tasted its rich aroma. Still puzzled, the boy asked, "What was all this about, Father?" His father explained that each of the three ingredients he put into the boiling water had faced the same adversity – the boiling water, but each reacted differently. The carrot went in strong, hard, and unrelenting. But after being boiled, the carrots had become soft and tender. Egg had been fragile with a thin shell protecting its liquid interior. But after boiling in the water, its inside became hardened. But the ground coffee beans were unique. Once inside the boiling water, they changed the water. The father then said, "When adversity knocks on your door, how you respond? Would you be a carrot, an egg or coffee? "What about you? Are you the carrot that seems hard, but with the pain and adversity its wilts and become soft and lost its strength." "Or are like an egg, which starts off with a malleable heart and a dynamic spirit, but after the death, heartbreak, divorce or dismissal, you become hardened and stiff. From the outside looks the same, but are you bitter and tough with a heart and soul so rigid?" "Or are you like the coffee beans? The beans changed the hot water, things that cause pain, to achieve maximum flavor at a temperature of 100 degrees Celsius. When the water reached the temperature of the hottest, the coffee was delicious." "If you're like the coffee beans, when things are at their worst, you will be getting better and making things better around you." "There's a giant in every person and there is nothing that can stop it except a huge giant's holding his own"
What are we today? Carrots - that have wilted and softened under pressure. Or eggs – hardened and rigid with extremism prevailing everywhere? Or the coffee beans, that have lost their aroma. It is time for us to decide who we are. It will be only then that we can address the quagmire we are in these days, otherwise we will only be left to tell tales to our children, who would at the end ask us who we have been. And we will have no answer.